BBC NEWS | Africa | Is the lottery a curse? Is the lottery a curse? Ghana has had a national lottery for 30 years, but many Ghanaians would laugh at the idea that it has been used for the good of the people. Critics also argue that lotteries merely create an addiction to gambling. Has your national lottery contributed to your country's development? Are you a lottery winner? Has it changed your life? Or has it left you broke and disappointed? Are you a gambler? I see the lottery as one of many get rich schemes available to all. I play the lottery on a weekly basis. Like everyone else in the rat race called life, I aspire to be rich and would embark on any quest (other than crime) to achieve my dream. I see the lottery as one of many get rich schemes available to all. Even though I'm yet to win the jackpot, I take solace in the fact that a percentage of my lottery fee goes towards good causes. Throughout both the developed and developing worlds, state lotteries are a voluntary tax on those who can least afford it. The English proverb that "A fool and his money are soon parted." may be true, but a government that taxes the poor is just as foolish. Unfortunately with state lotteries both those who stake the lottery and the governments who run them quickly get addicted to them. My $10 a week for Lotto doesn't hurt anybody and part of the proceeds goes back to the government which in turn goes to hospitals and so on. Of course it only works if your government is trustworthy and accountable to the people. The chances of winning a major prize (depending on the game) ranges from 1:160,000 to 1:85 million so nobody expects to win, it's just a little fun. There is no God in gambling!!! But I'm feeling the pull to go throw some coins now - is this addiction? Why do people look for cash where they didn't stash it? Africans, beware of the lottery & games of chance. When one calculates the probability of winning, one sees that it is only by an act of God that one can win. There is no God in gambling!!! But I'm feeling the pull to go throw some coins now! Is this addiction!? If National Lottery is well handled, and certain proceed percentage channelled to social courses, then participation should be encouraged as that will curb tax evasion by some citizens. Setting up a national lottery is as simple as creating more opportunities for the criminals. It is the governmental system of having a hand in the scam business, and even if it works in other countries, it's impossible to work in Nigeria. the national lottery in Ghana has contributed to the development of roads and other social amenities. it has contributed to employment especially to university students who are on vacations. but we should not forget that this same thing is causing the break down of families. money to buy food and pay fees are used to gamble. to a larger extend I think lottery has helped in the development of my country. 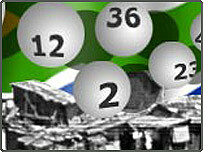 Lottery is not only a curse but a satanic practice which is manifested in Cameroon in the form of horse-race gambling. People bet theirs lives and families on horse races that take place far away in France. With devastating consequences being recorded. The story is told in Bamenda town of a responsible family man who had three shops in the Bamenda Market and at the end of the day his capital was depleted through gambling. I dislike any game of chance. Lottery in my country has instilled hopeless hopes and laziness in some people. I believe in hard work and would like to encourage others not to rely on gambling. There is no guarantee that if a person in Africa wins the Lottery, he or she will get the money. To me it's just a rip off. I don't know about others, but winning the UK lottery is virtual impossibility. The odds are stacked against you in every imaginable way. I stopped trying many years ago. I don't believe in the game of chance therefore i don't believe in lotteries. Lottery is not good as it breeds laziness, forgery, poverty, exploitation and conflict. The case of the lottery in my country reveals very dispiriting experiences. I suggest it should not be encouraged! The national lottery in my country is to a very large extent a blessing as it plays a pivotal role in the development process. Since my country is just emerging from a decade of brutal and devastating war, the State lottery has been helping in the development of education as it sometimes gives out scholarships to students. While the money earmark from the sale of lottery tickets could help in building some infrastrures, it ends up in the accounts of the organisers. It doesn't benefit the society. I gambled in the past but I never made it a habit. Gambling is a matter of principle and self discipline.